"The Pasha's daughter was an adventuresome little lass with great liquid eyes - eyes that dazed and dazzled the men of her native Islam - and a foreigner who strayed there. The foreigner was a young American traveling for recreation. He became friendly with a Pasha, father of the girl with the eyes, and the friendship resulted in his arrest for conspiracy along with the old Turk. But the subsequent imprisonment has its good points for it enables him to win his way into the girl's good graces - and the girl enables him to win his way to freedom." "Jack Sparks is a young American, who, while traveling in Turkey, meets and befriends an aged Turk, who invites him to his home. Soon after his arrival the Turk is arrested for conspiracy against the government, and Jack, who is believed to be an accomplice, is also imprisoned - without a hearing. The crumbling walls of the old Turkish prison are not strong enough to hold the young American, and he soon makes his escape. He is pursued by an armed guard and takes refuge in the courtyard of the Pasha's palace. There he is protected from recapture by the Pasha's daughter, Murana, who finds him a hiding place and then helps him to escape in the garb of a Turkish woman. Jack upon leaving tries to induce Murana to fly with him, but in vain. He gives the beautiful Turkish girl, with whom he is greatly in love, his card in exchange for a rose, but he scarcely dares hope that he will ever again see the glowing eyes of the veiled beauty whose name he does not even know. "Jack makes his way in safety to his American home, and while gazing at his rose, the one token of his romance which has left him, a visitor is announced. He and his mother stand puzzled as a beautifully dressed young woman is ushered in. Although there is something about her which suggests the past to Jack, he fails to recognize his Turkish sweetheart until she hides the lower part of her face with her veil, showing only the beautiful eyes with which Jack fell in love. She tells Jack that she has decided to be not only a Pasha's daughter but an American's bride." "This picture presents a story that is decidedly original and away from beaten paths. The settings in Turkey are elaborate and faithful to Turkish customs. All the players portray their respective parts in an excellent manner. The photography is very good." 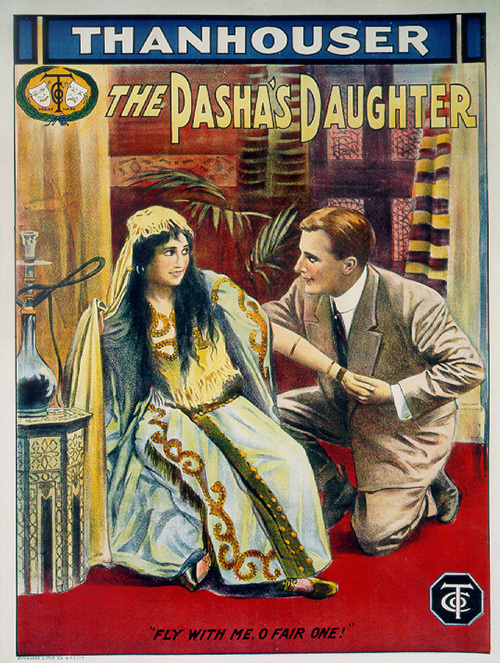 "An American young man in trouble is assisted by the daughter of the pasha to escape in woman's clothes from the Turkish dominions. He urges her to go with him, but she refuses. They exchange tokens. Some months afterward a handsome girl appears at his home, whom he does not know, but when she covers the lower part of her face he recognizes the eyes. She tells him that she has decided to be an American bride in addition to being a pasha's daughter. The scenic effects are interesting and the story is lively enough to keep the audience wondering what the end will be." "The first scene of this picture opens with the inside of a moving coach. While it lasted the effect was good. It was there that the young American met the Turkish nobleman, who took him to his home. The hospitality ended in his being arrested as an accomplice in a conspiracy against the government. It cannot be that they search their prisoners in Turkey, for the young man took out his knife and dug away the mortar holding the window bars of his cell. Of course, he used the bed clothes, tied in strips, to escape. He forced his way into the grounds of the Pasha, where he came upon the daughter. She concealed him and aided his escape. He exchanged his card for a rose and left her with the promise that she would come to America. A year later she appeared at his home and decided to be no longer the Pasha's daughter, but the wife of a plain citizen. It was well enacted and the sets were fully adequate, creating a fair illusion of the Oriental land depicted."